I adore inspirational jewelry, especially hand-crafted pieces that are created by talented designers who have a passion for their craft. Beth Quinn Designs has a beautiful collection of hand-made jewelry with an inspirational theme. What makes Beth Quinn Designs even more special is that you can create your own one-of-a-kind piece of jewelry! Becoming a mother of three was the most life impacting moments of my life and I love the “Motherhood is a Journey” necklace ($35) from Beth Quinn Designs. This lovely necklace has an antique, vintage look featuring a pretty silver key that dangles next to a small 18 mm hand glittered charm that says “Motherhood is a Beautiful Journey”. 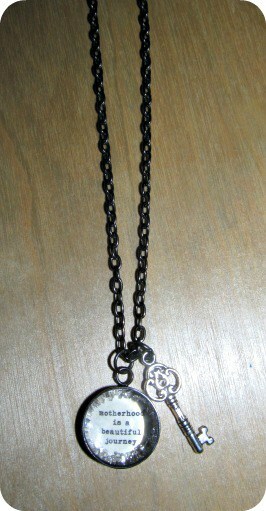 I like the gunmetal style but you can also choose classic silver for the chain. 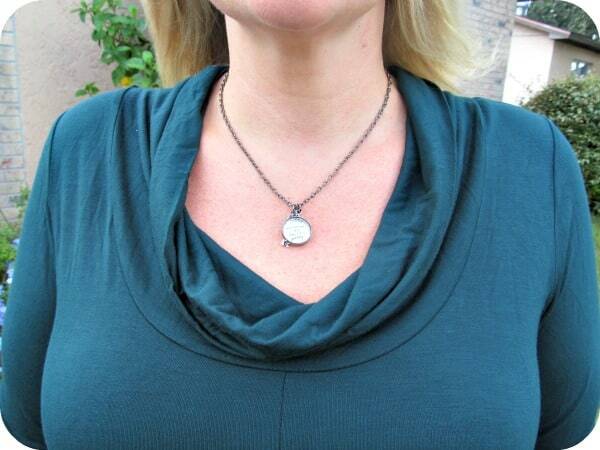 The necklace hangs beautifully and it is nice with both casual and dressier styles. Every time that I wear this necklace, it is a positive reminder for me to be thankful for my children as we go on this journey together. Beth Quinn Designs offers jewelry designs for women and little girls, weddings and holiday styles too. The prices are very affordable, especially since each piece is hand-made and the quality is very nice. Beth Quinn Designs make excellent gift ideas with a variety of price points and you can even select a few of your favorites for yourself! I really like the “You Are So Loved” necklace ($25) for little girls and I may surprise my daughter with this for Christmas. If you love personalized jewelry as much as I do then you are going to want to view the Custom collection where you can design your own charm or birthstone necklace for yourself or someone special. You can visit Beth Quinn Designs to browse the entire collection of inspirational necklaces, bracelets and more. Which one is your favorite? I like the “she is perfectly imperfect” necklace. Please Enter Me In Your Beth Quinn Designs Giveaway. It Would Be Great To Win A $35 Necklace Of My Choice. and comment on which necklace i like the best. I Liked The she has a heart of gold Necklace. I like she is perfectly imperfect. My favorite is the find your sparkle aqua necklace.